The pinnacle of fraternal and professional societies, centered on the potential of each brother, the unquenchable thirst for personal development and the lifelong values of friendship, sound learning and rectitude. Each year we celebrate the end of rush by walking the steps of the Administration building along with the other fraternities at Texas A&M. This year, we were excited to participate in this celebration with our pledge class of 30 bright young men. 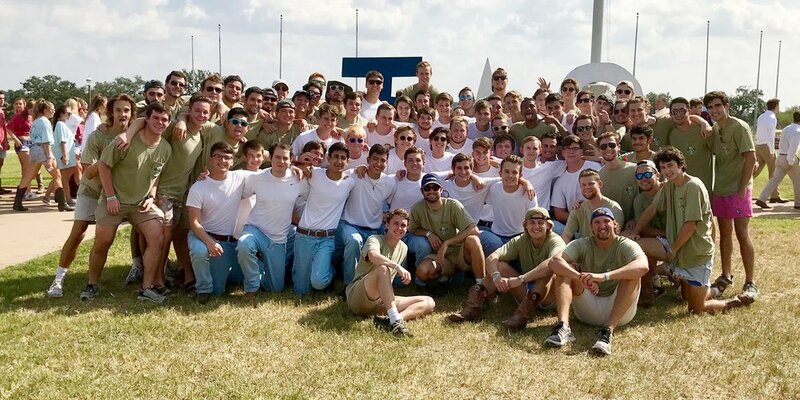 Not only does the active chapter enjoy Bid Day, but it is a chance for our future brothers to see what we are all about and have a good time while doing so. One of the most important aspects of our fraternity is our focus on brotherhood. We can build our brotherhood by hosting events, community involvement, and retreats throughout each semester. Perhaps our most fun way of getting closer to one another are the annual spring break trips we have such as the Colorado trip pictured above. Most chapters get involved with the community by hosting and attending various philanthropy events. However, the men of Phi Delta Theta don't stop there. On top of philanthropy events, we continually involve ourselves in the community through outlets such as the Adopt-A-Street program through the city of College Station.